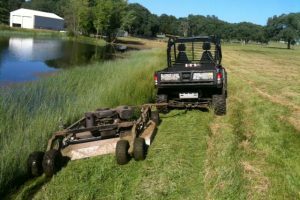 With about 10 acres to mow including several with very thick and tall meadow grass, I wanted to make sure I had enough power in a Rough Cut Mower. I also wanted a good sized deck so I could get the job done without spending days doing it. What I found during my search for a tow-behind mower is two scenarios, low horsepower and/or small deck.